Viva to the curiosity that all the artists have, and that pushes them to take the roads of the unknown! In a search for the novelty we sometimes overpass our own expectations and suddenly find something incredible. We find new passion that promises to push aside all our old ones. Lamp work beads are made out of molten glass using an age old method which has been passed down through generations, but still uses its original techniques. The process is based around the melting of glass in order to remolded it into the desired shape. The process begins with narrow rods of glass being melted with the flame tip of a torch. The molten glass is than wound around a mandrel which is a thin, stainless steel rod. The removal of this mandrel will therefore leave a hole through the center, creating a bead which can be threaded whilst reducing the risk of cracking the glass. Whilst the glass is around the mandrel it is turned into different positions to enable it to take shape. 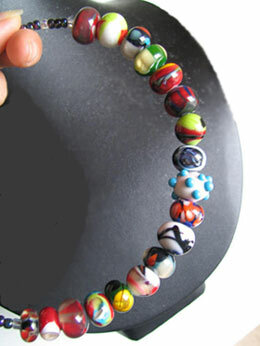 Glass lamp work beads can be produced in a variety of styles for example with dots, stripes, a mix of layers and a multitude of colors. My first thought is… what should I do to stop my hands from shaking? Just a minute later I am trying to manage the glass drop on the end of the tube with my right hand. I need to spin my mandrel with my left hand and make an accurate glass spiral. The fire magic process takes all my attention and I am forgetting to control my face. Who knew that glass was so fickle? It is soft and pliable, fragile and capricious at the same time. It can take any shape in a master's hands. It can turn into an animal or an exquisite vase. It can flow, turn or stretch as the thinnest thread as on an order of a wand. Modern beadmakers use single or duel fuel torches, so 'flameworked' is replacing the older term. Unlike a metalworking torch, or burner as some people in the trade prefer to call them, a flameworking torch is usually "surface mix"; that is, the oxygen and fuel (typically propane, though natural gas is also common) is mixed after it comes out of the torch, resulting in a quieter tool and less dirty flame. Also unlike metalworking, the torch is fixed, and the bead and glass move in the flame. You need to be tender and attentive. If glass cools down too soon, it will crack in your hands. When you are turning your mandrel, it looks and acts like a drop of honey trying to crawl down obeying to the gravitation forces. Here it is! So round. I think it is done. I take it out of fire and keep rotating the mandrel, as the glass is still liquid. I am observing the real magic transformation. My bead gets darker and the colors become visible. It is time to put it into a special substance where it can cool down very slowly without cracking. Only 30 minutes later I finally can see my newborn bead. I am examining it carefully and being amazed how colors intermingled and beautiful flowers blossomed out under the transparent surface as if from nowhere. I still have to learn a lot. I discovered an increasable magic world of glass for myself and understood that its possibilities had no limits. There is nothing to stop your fantasy. Glass fairy-tale that has come to my life as just a glass bead will stay as one the most wonderful discoveries in my art.